On the basis of some of the works, “Surface” may be described as a portrait show with an agenda beyond the business of likeness. Colleen Kelsey exhibits 2 works showcased in the front room. “Artist”,a graphite/charcoal drawing on a pinky cream sheet, depicts the rendering of likeness of one Heather Lea Reid. Utilizing scribble shading and erasure reduction technique for hair and formal rendering, the drawing is a typical facial rendering enhanced with a sanguine tone on the cheek bone. 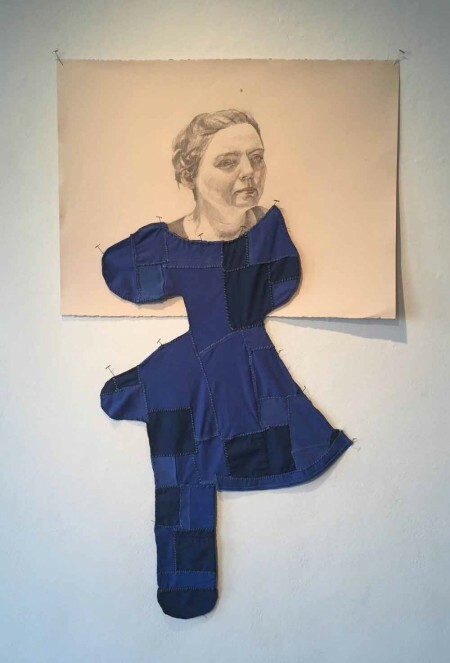 Stick-pinned onto the neckline of the bust is a blue patchwork of multiple fabrics vaguely organized into a feminine dress shape with a dropping vertical suggesting a phallic appendage. The artist’s intent here is to make a statement about the assumption of the father/mother roles by the single mother, a growing description of ‘family unit’ in contemporary societal order. The title “Artist” also refers to the professional career choice of Heather Lea Reid, the real life friend who inspired this work. The five headed Beavercreek Walmart piece commemorates the John Crawford III shooting of August, 2014. The activists heads are charcoal-rendered on tea or coffee dyed raw canvas which are crudely hemmed cutouts. 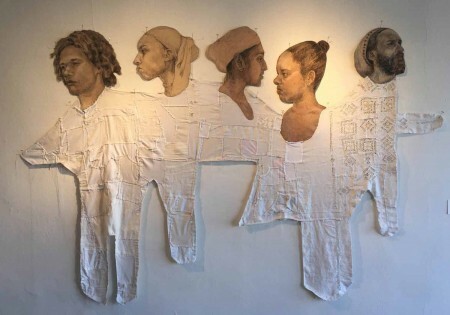 A montage of lace and patchworked materials, all generally white cotton and linen and of one piece, loosely alludes to the physical body-ness of some figures while denying the same for others. Perhaps the shape can be read as depth differentials, although all the heads are same sized and therefore perceived as sited in the same space. 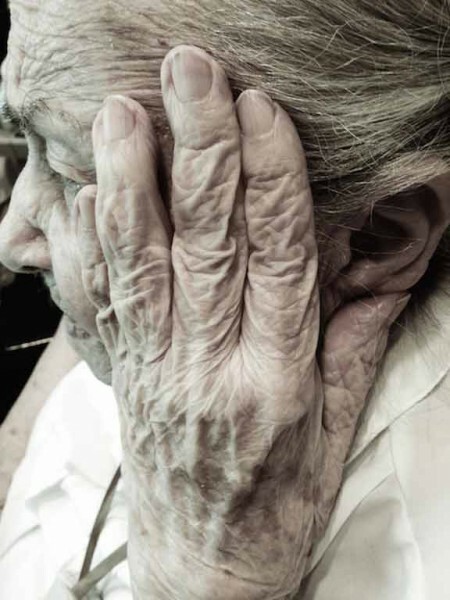 “Mother’s Hand” is a beautiful archival print by Vera Mariner. At roughly 3X the size of a typical adult hand, the softly tinted photo records her mother’s fingers, now careworn and shapeless, laid to the temple of the aging loved one. The neglected untrimmed nails and tissue paper thin skin sprinkled with sun spotting is crease-crumbled and no longer adheres to joint and knuckle, sagging into structureless sacking. In contrast, Trinidad MacAuliffe exhibits “Re-Structuring”, an archival digital print on metal, and is a highly theatrical, larger than life-size profile of an androgynous youth. 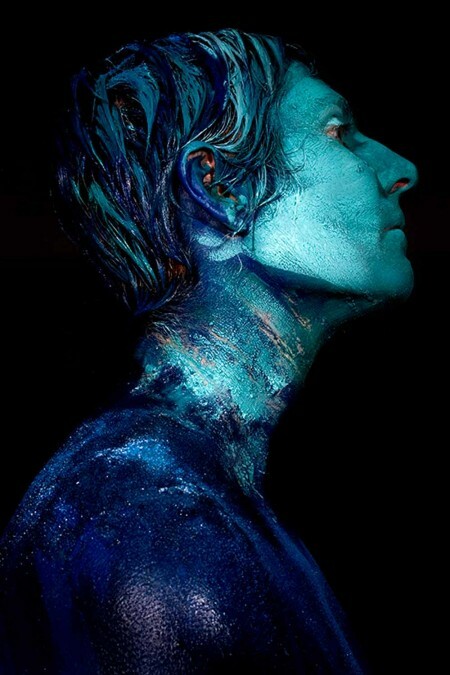 The head, neck and shoulders are thickly smeared with deep cobalt blue and lurid turquoise paint. The occasional natural flesh tone furtively appears radiating from the inside of the nostril and crackles with lava-like heat around the inner ridges of the ear and the ripping creases of the neck. The painted hair is goo-ed the cap of the skull with alternate tresses of deep blue and garish turquoise. Other works in the show vary in media and style of depiction: charcoal, pastel, silkscreen, hard edge acrylic abstraction and traditional oil. 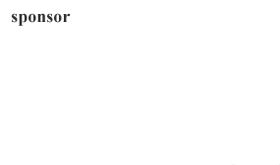 Statements vary in theme: alienation, commonality of infancy and artless naiveté. Two oversized charcoals of drowsy stupors timed out on couches underline the lack of message here. “Surface” is exhibited through January 7, 2016.